During both WWI and WWII, country residents sought ways to memorialize their family members, friends, and neighbors who were serving in the armed forces. One of the most popular ways they found was by erecting an honor board. These wooden signs listed the names of locals in the military. Special notation was usually provided to observe individuals killed in action. Boards such as these were erected in each Shenandoah County town. This board was designed to honor those residents of the Ashby Magisterial District, which surrounds and includes Mt. Jackson, who served in the conflict. After the war most of the boards were removed, often when more permanent memorials were erected. However, the Ashby District Board remains in Mt. Jackson and lists the names of those who served in that town and surrounding communities. 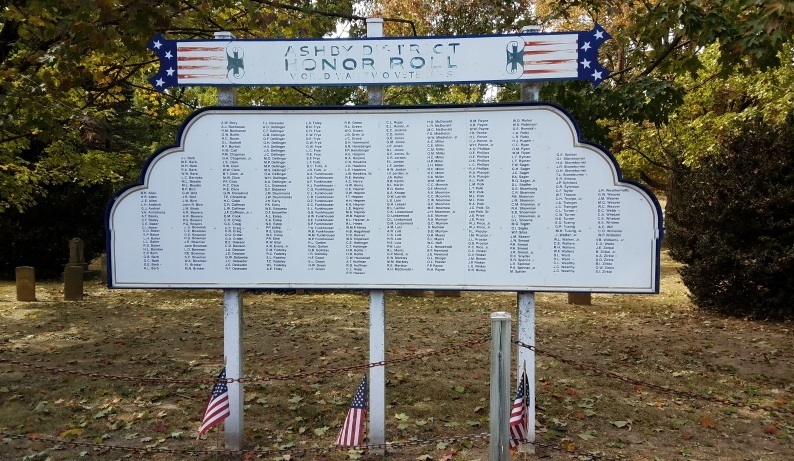 “Ashby District Honor Board,” Shenandoah Stories, accessed April 25, 2019, http://shenandoahstories.org/items/show/307.